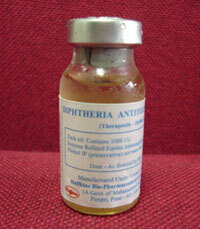 Anti Diphtheria Serum I.P. (ADS) ADS is a solution of purified antibodies prepared from Equine Blood.It is available in Ampoules ranging from 1 ml. to 10 ml. Indication : Passive immunising agent. Dosage : Therapeutic - 10,000 to 30,000 units increased to 40,000 to 100,000 units in severe cases.Doses upto 30,000 units are given I.M. but for doses over 30,000 units a potion is given I.M. remaining dose IV after 1.5 to 2 hours cover of anti histaminics essential. Antihistaminics and treatment for anaphylactic shock should be kept ready. 2) Whether there is personal or family history of allergy i.e. asthma, eczema or drug allergy. The sensitivity of the patient to serum is tested by injecting subcutaneously 0.1ml of diphtheria antitoxin diluted 1:10 and the patient is observed for 30 min. for local and general reactions. If the test dose shows either local reaction such as wheal and flare or general anaphylactic reaction such as palor, sweating, nausea, vomiting urticaria or fall of blood pressure, these should be treated with 1ml of 1:1000 adrenaline (which should always be kept handy) before injecting the main dose of diphtheria antitoxin. Half the dose of adrenaline may be repeated 15 min. later if necessary. In allergic individuals, the diphtheria antitoxin is to be injected 15 to 30 mins. after administration of antihistamines such as injectable Antistine (100mg) and Injectable Hydrocortisone (100mg) intramuscularly. One ml of Adrenaline (1:1000) may be injected intramuscularly at the same time as the antiserums. Administration of hydrocortisone or adrenaline may be repeated if necessary.